In this construction video tutorial, the renowned engineer, Mr. Parag Pal, has briefly explained the center line method for computing quantities of materials used in the building. The method is used with the plan of the building with section. 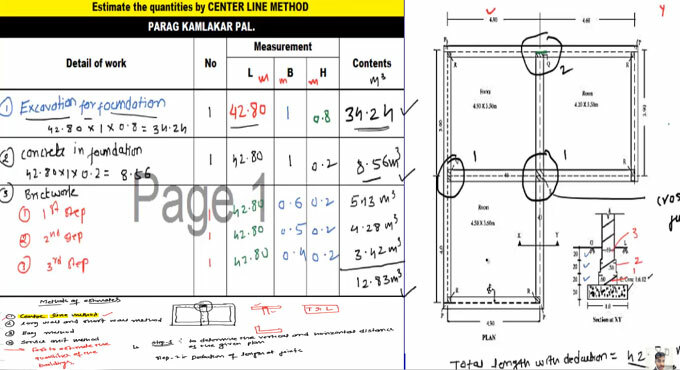 Center line method: This method is used to determine the quantity of wall or any construction building. This method ( Centre line ) is effective for walls which contain identical cross sections. To quickly determine the total quantity, the total centre line length is multiplied with breadth and depth of related item. When cross walls or partitions or verandah walls are affixed with main wall, the length of the centre line is reduced by half of breadth for each junction. Such junction or joints are evaluated carefully while going to calculate the total centre line length. Long Wall and Short wall method - Under this method, the wall across the length of room is treated as long wall whereas the wall vertical to long wall is considered as short wall. To obtain the length of longwall or shortwall, initially work out the centre line lengths of individual walls. Then the length of long wall, (out to out) should have been computed as soon as half breadth is at each end to its centre line length. Thus the length of short wall measured into in and is obtained by subtracting half breadth from its centre line length at each end. Bay method - This method is usually applied if the building contains various bays. The cost of the one class room is estimated and then multiplied with the number of bays in that building. It also includes the additional cost of the end walls and discrepancy in framing. Service unit method – The work ‘service unit’ is associated with the purpose of a building or civil engineering work. Approximate estimates for different types of buildings/works can be done with the service unit method. The approximate estimate in this method is dependent on the cost per service unit that is accrued for a building or work built up in recent times.